MANILA, Philippines – (UPDATED) Despite playing without their top hitter in Jhoana Maraguinot, the Ateneo Lady Eagles still had enough firepower to take down their arch-rivals, the De La Salle Lady Spikers, and secure the top seed in the Final 4 of the UAAP Season 79 women's volleyball tournament. In front of over 18,000 fans at Araneta Coliseum on Saturday, Ateneo bucked a slow start to hack out a thrilling 12-25, 25-20, 25-21, 25-19 victory to finish the elimination round with a 12-2 win-loss record. For the third consecutive season, they finished as the No. 1 seed, and booked a date with Far Eastern University in the Final 4. "S'yempre, malaking achievement din ito sa team," said Ateneo assistant coach Sherwin Meneses after the game. "'Yung performance nila sa elimination, maganda so pagdating ng semis, mataas ang morale nila." "Ganoon naman 'yun," he added. "No. 1 ka, so mas mataas ang morale niyo kaysa sa ibang team." 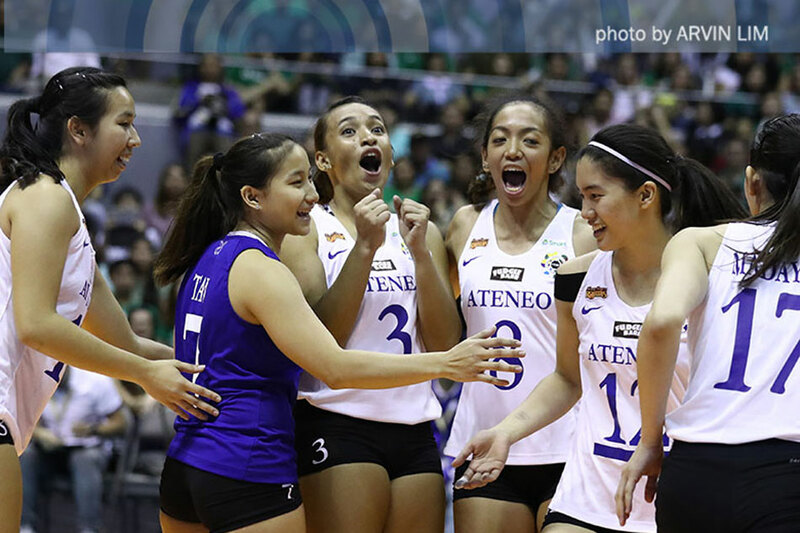 Ateneo had already beaten La Salle in the first round, and the two teams were already assured of the twice-to-beat bonus in the Final 4 regardless of their seeding. The Lady Eagles thus opted to rest Maraguinot, and started Ponggay Gaston in her stead. The gambit backfired in the opening frame, as La Salle cruised to a 25-12 victory. The Lady Eagles were unable to handle the Lady Spikers' loaded serves, and Majoy Baron was nearly unstoppable. "Slow start, at 'yung service ng La Salle, napakaganda noong first set," said Meneses. "Hindi talaga namin ma-receive. Buti, naka-adjust 'yung mga libero namin." Ateneo slowly got its bearings in the second set. Rookie Jules Samonte made an immediate impact, and the Lady Eagles proved to be the more composed team down the stretch of Set 2. After Desiree Cheng tied the set at 18-all, the Lady Eagles won seven of the next nine rallie. Maddie Madayag came through with a clutch service ace for the set point, and La Salle gift-wrapped the frame for Ateneo when team captain Kim Fajardo was called for a net violation. In a nip-and-tuck third set, the Lady Spikers briefly pulled away, 20-17, thanks to back to back service aces from Aduke Ogunsanya. But Ateneo responded with a 5-0 blast, anchored on Jia Morado's steady serving. A down-the-line kill by Arianne Layug brought La Salle to within one point, 21-22, but Tin Tiamzon was called for a net violation in the next rally, Michelle Morente fired a cross court kill, and Layug's last attack was deemed wide to give the Lady Eagles the win. Ateneo proceeded to control the fourth frame, pulling away from a 17-15 count thanks to two straight aces by Bea de Leon that highlighted a 4-0 run. That allowed the Lady Eagles to surge ahead, 21-15, and they never looked back from there. Meneses admitted they did not expect the win, given Maraguinot's absence. 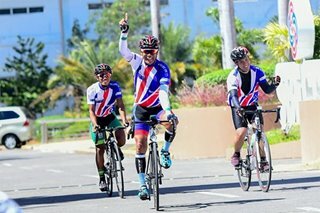 "Hindi masyado, pero maganda ang nilaro ng team eh," he said. "So 'yung position ni Jho, napunan ni Jules, at parang parehas lang din 'yung first six." The rookie Samonte tallied 10 points, while Morente and De Leon had 14 points each to power the Lady eagles. Morado finished with two points on top of 34 excellent sets. Kianna Dy led the way for the Lady Spikers with 15 points, while Cheng added 13 markers and Baron finished with 11. Fajardo accounted for five of La Salle's nine aces, and added 40 excellent sets as well. The Lady Spikers actually outgunned the Lady Eagles, 47-37, but they gave away a stunning 36 points off unforced errors. Ateneo, meanwhile, limited their miscues to 24. La Salle settled for the second seed for the third year in a row, and arranged a Final 4 showdown with University of Santo Tomas. The Lady Spikers play the Tigresses on Saturday, April 22, at the Araneta Coliseum, while the Lady Eagles play the FEU Lady Tamaraws, on Sunday, April 23, at the Mall of Asia Arena.